Stunning Alta Vista Renovation – Gorgeous Private Lot! Sold within 24 hours for more than asking price! One of the prime properties in one of Ottawa’s most desired neigbourhoods! 1887 Ferncroft Crescent. Only $629,000! Great living and entertainment space in this beautifully renovated Garand built home. The open concept main floor flows nicely, tied together by the warm solid oak floors, high baseboards and curved crown mouldings. Custom lighting everywhere. Whether it’s just the family or a gathering of 80 or so of your closest friends, this home just works! The pie-shaped lot expands out in the back to create a huge park like setting providing your own private oasis! Without a doubt one of the nicest properties anywhere in Ottawa. Main Floor: The gourmet custom designed kitchen features exquisite granite counters, stone tile backsplash and all the right equipment, including double wall ovens, Jenn-Air cook top, Sub-Zero fridge, and much much more. The kitchen serves both the large formal dining room and the comfortable eating area which overlooks the very private backyard. The great room/den/family room offers room for a grand piano, cozy entertainment area and/or casual conversation around the antique marble fireplace. 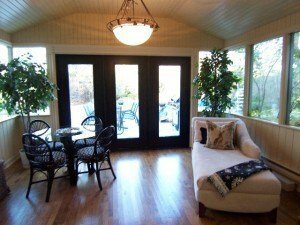 Relax in the sunroom, or move right out onto the expansive deck overlooking your own private park! The estate like back yard is beautifully landscaped and the surrounding trees and gardens make for a very secluded feel. Plenty of room to enjoy badminton or croquet or simply relax around the inground Gunnite pool and enjoy the peaceful view. Whether it’s peace and tranquility you’re looking for, or great backyard garden parties, this is the perfect spot! You’ll feel like you’ve escaped to the cottage, yet you’re only 10 minutes from downtown. Forget the daily and weekend commutes and live life to the fullest every day! Laundry and powder room are also conveniently located on the main floor. Second Floor: Upstairs there are 4 large bedrooms, a main bath room, and a 4 piece ensuite with skylight off the master bedroom and very spacious center hall. Built in shelves and cupboards galore provides for tons of storage. Downstairs: Downstairs there’s another 3 piece bath with stand-up shower, large 5th bedroom and a huge family/recreation room complete with wet bar. Makes for a great inlaw suite, or perhaps some separation from the teen-age crowd. Location: Located in the Guildwood Estates portion of Alta Vista you’re just minutes from downtown and within easy walking distance to the schools – such a great family house in a great neighbourhood – no one will want to leave! This home has just an endless list off features and conveniences built right in, you really have to see it to get the full picture. More Photos: To see more pictures of this property click here or click on the Property Listings link in the left margin. Vista to Kilborn, go east on Kilborn, right on Featherstone and left on Ferncroft. Click on the attachments below for a printable flyer which includes the roomsizes and other specifications.